Citizen science—scientific research conducted by nonscientists—is rapidly becoming a tool to bring relevant, hands-on learning to young people. But connecting professional scientists with educators and youth can be tricky. Science center educators are bridging the gap. The Association of Science−Technology Centers, or ASTC, an Educator Innovator partner, recently featured some outstanding citizen science projects on its blog. Many of them feature a complex set of partnerships, with science center educators at the center. Carlin Hsueh is one of them. Hsueh has been striving to explain science to the public since her days as a PhD student in nanotechnology. “It’s been my life goal to get the science out there in ways the public understands,” she said. Hsueh got the hang of it through a yearlong National Science Foundation fellowship, where she learned to explain her work to young people by eliminating jargon and using hands-on examples. Today, she puts those skills to work as a science educator focused on teacher professional development at the Chabot Space and Science Center in Oakland, California. She and Chabot serve as the hub for a unique partnership connecting atmospheric chemists from the University of California, Berkeley with high school teachers and students from the San Francisco Bay area, as well as GLOBE (Global Learning and Observations to Benefit the Environment). Through GLOBE, students contribute air quality measurements to a worldwide environmental database. The partnership started when atmospheric chemist Ronald Cohen approached Chabot for help in developing an education project around the Berkeley Atmospheric CO2 Observation Network, or BeACON. Through BeACON, Berkeley scientists monitor air quality sensors mounted on 18 buildings—mostly schools—in the East Bay. The sensors measure the amounts of three key pollutants: carbon dioxide, nitrogen dioxide, and ozone. Although high school students aren’t allowed to work directly with these sensors, they can access the data they generate. Chabot created investigations that teachers could use with their students to work with the data, and he began facilitating classroom visits from Cohen’s graduate students. For Noonan, who holds a PhD in biology, the opportunity to connect with working scientists—both through visits and workshops at Chabot—keeps her engaged with the latest in environmental science research. “An interested and excited teacher is a way better teacher than one reading out of a book and trying to get kids to bubble in certain things,” she said. 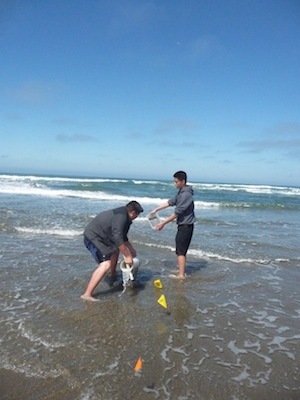 Sand Crabbing with the California Academy of Science’s Careers in Science intern program. Museums are helping informal educators access citizen science as well. The California Academy of Sciences is working with 15 after-school programs in San Francisco Bay Area middle schools to sponsor Science Action Clubs. Through these clubs, young people participate in a variety of citizen science projects, from observing urban birds to helping NASA scientists “ground truth” satellite data by observing local clouds within a few minutes of the satellite’s passing. But contributing data—which can take as few as 10 minutes—is only the beginning. “In order to enhance the science, we provide additional activities and investigations so the educator can facilitate a more well-rounded experience,” said Levedahl. Science Action Club participants use iPads—“loaded with extra content”—to collect data and to engage in those additional investigations. Levedahl and her staff have trained after-school program providers to use the tool. They’ve also produced “Earthquake,” and in partnership with the University of California Museum of Paleontology, “How Science Works,” for teachers. They’re now preparing a citizen science toolkit for release this summer to help educators use citizen science as a springboard for connected learning. Connected learning unites what kids care about the most—their social world with something they want to get better at—and then connects those with a real-world payoff, such as a better grade or some other form of recognition. The ultimate goal is to create more pathways for more young people to have opportunities for success. In San Francisco, high school students who want to go deeper into scientific research can join the Academy’s Careers in Science intern program. Careers in Science interns are the longest-running contributors to the National Marine Sanctuaries Long-term Monitoring Program and Experiential Training for Students, or LiMPETS. Students collect and analyze data, and then they present it at a poster session during the American Geophysical Union’s annual conference. “There are papers that have been published based on research questions the interns have asked,” said Levedahl. This visibility is an additional benefit of digital science projects. The feedback, educators find, often motivates students to go above and beyond. Feedback from a wider online audience that includes their peers can carry more weight than even a teacher’s feedback. These experiences mean more to students than simply completing a class assignment. The exchange and feedback moves learning to a more engaged level. Although there are plenty of citizen science examples out there, the future of citizen science must work to break down the silos between individual projects, according to Darlene Cavalier, founder of SciStarter. Currently, there are citizen science birder projects or pollution monitoring projects, but they rarely—if ever—collaborate in larger ways. But as Cavalier says, if given the right mechanism, these communities could “self-pollinate” in productive ways, allowing people to gauge the effect of multidisciplinary learning or consider broader outcomes as measures of engagement. Photos courtesy of California Academy of Sciences.